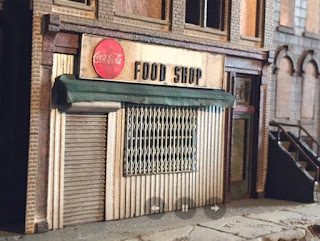 Over the years, I've profiled the work of a few miniaturists on this blog (Alan Wolfson, Randy Hage, Nicholas Buffon), artists who render the city smaller -- and thus preserve some facsimile of what was. 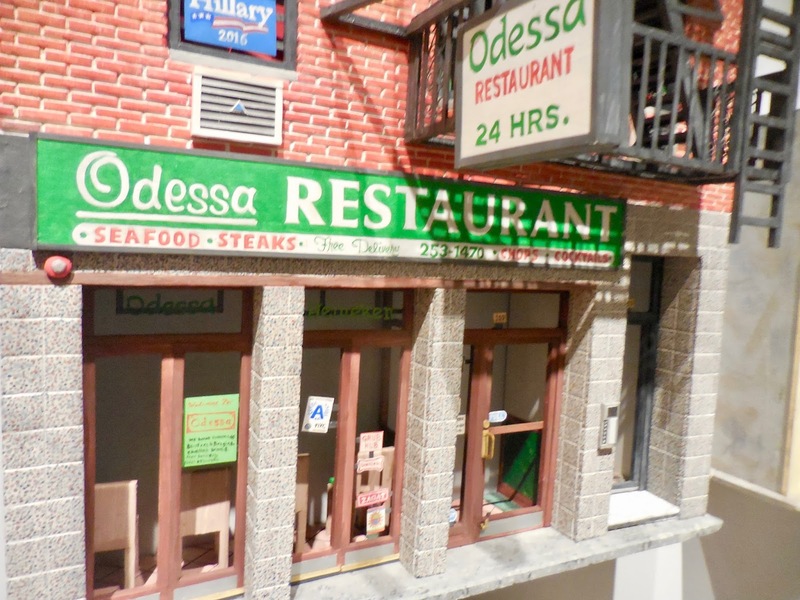 This week, Sensitive Skin magazine shares the work of Dennis Gordon, who created a whole Lower East Side in miniature -- or, at least, a dreamlike representation of what the Lower East Side once was. 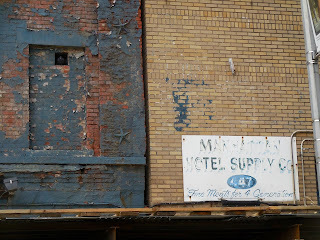 "I felt extremely comfortable in the midst of neglect and decay. The abandonment, loneliness, and isolation inside the structures grounded me despite the risk (though the buildings were abandoned by society, I was hardly alone). I discovered an escape from the boredom of inhabited space, and grew lost within the wealth of bygone architecture and design. I felt like I was participating in some grand installation of living art. The decay was dynamic, the interiors different if I revisit them in a year. New levels of rust and mold. 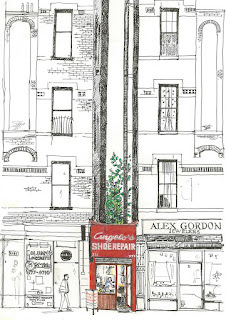 Brick disintegrating and nature slowly prevailing, ailanthus trees growing through floors, replacing man-made elements. Where some people saw eyesores, I saw the labor of architects, craftsmen, and assemblymen using complex machinery built as durably as the products they made. 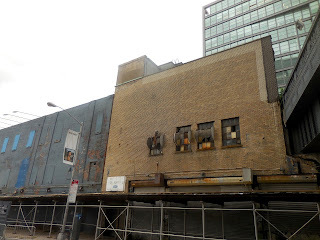 To me, each abandoned building tells a story from our past, and all these buildings tell a collective story of our present, of an era of greed when everything–from architecture to wares to art–is disposable, replaceable." Read more and see more at Sensitive Skin. 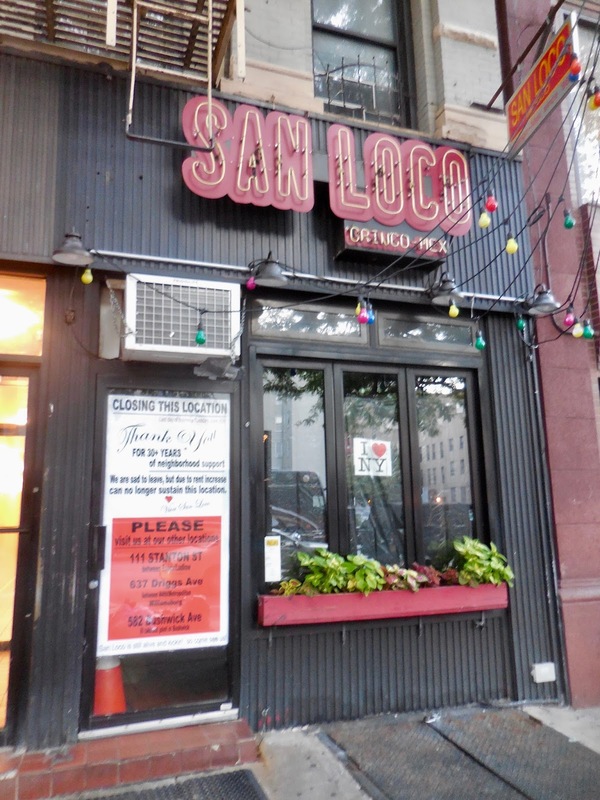 The Second Avenue San Loco taco joint supplied my first meal in the East Village, 23 years ago. 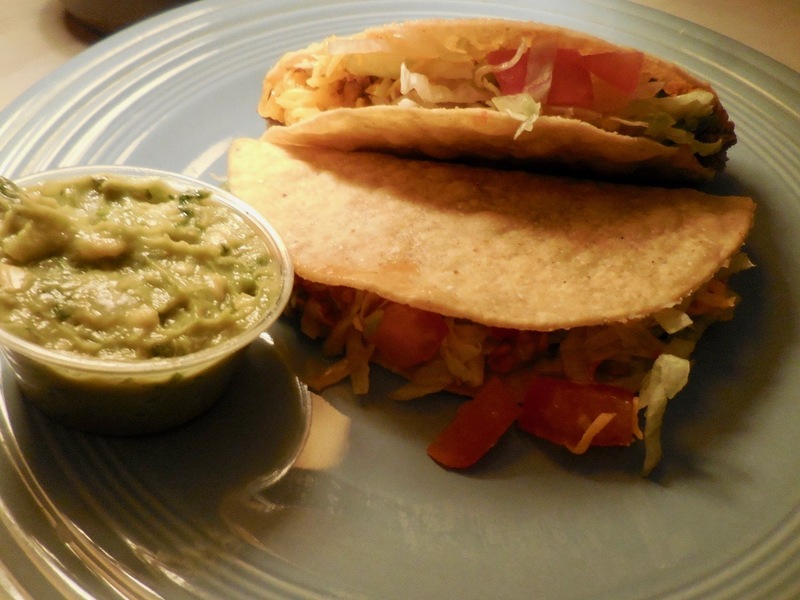 I ate those crunchy tacos on my fire escape after a long day of moving in. 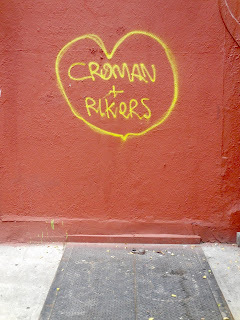 Back then, it was across Second Avenue, a hole in the wall bedecked in yellow and red. The place was always full of customers. On its last night, it was packed. And now it's gone. The rent was too damn high. 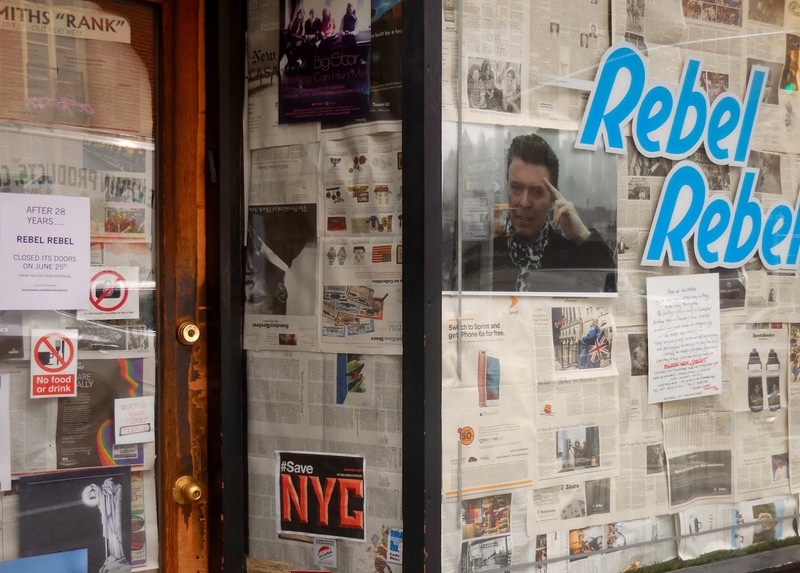 In the plastic-covered windows, the owners have posted an "I Love NY" sign. The neon lights are dark. "There are many factors that contribute to our struggle to survive--and the noose definitely keeps tightening. Our customer base has been mostly squeezed out of this neighborhood as a consequence of hyper-gentrification. Rent is a constant source of stress. 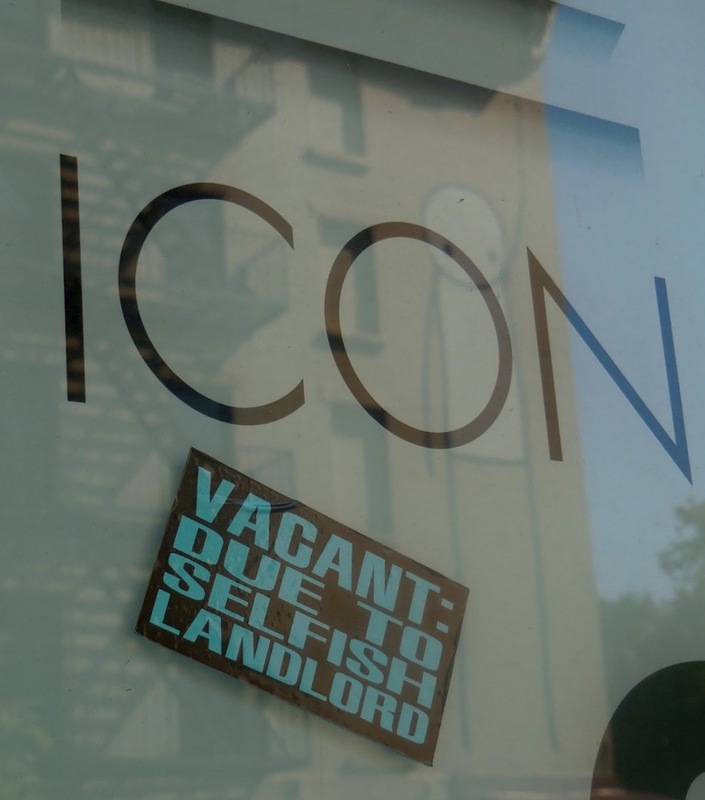 In our case, as with many long-standing businesses, we are at the mercy of the landlord and live in fear of our next rent renewal." That fear has come true. As it does every day for many long-lived small businesses in New York City. For other San Loco locations, click here. Come celebrate the publication of Vanishing New York: How a Great City Lost Its Soul. Books will be on sale. I'll be reading and signing. There will be refreshments. And--bonus!--downtown legend, the great Penny Arcade, will be performing. Looking forward to seeing you there! For the past 10 years, since July 2007, I've written this blog openly under a pen name. Now, as my book is about to publish on July 25, I figured it's time to come out of the blog closet. A decade is long enough. 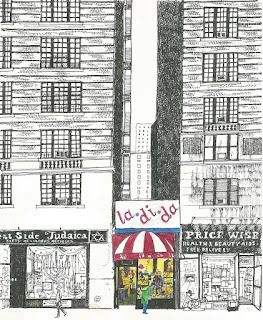 I tell my story to Michael Schulman in this week's New Yorker magazine, on the pages of the "Talk of the Town." 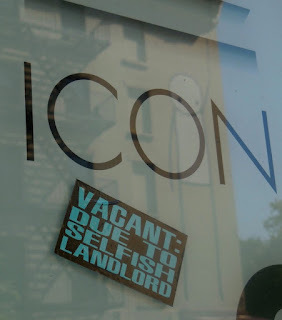 The graffiti refers to the local "Bernie Madoff of Landlords," as the attorney general called him. He is serving a year in jail at Rikers Island after being charged with 20 felonies. So this building is gone. 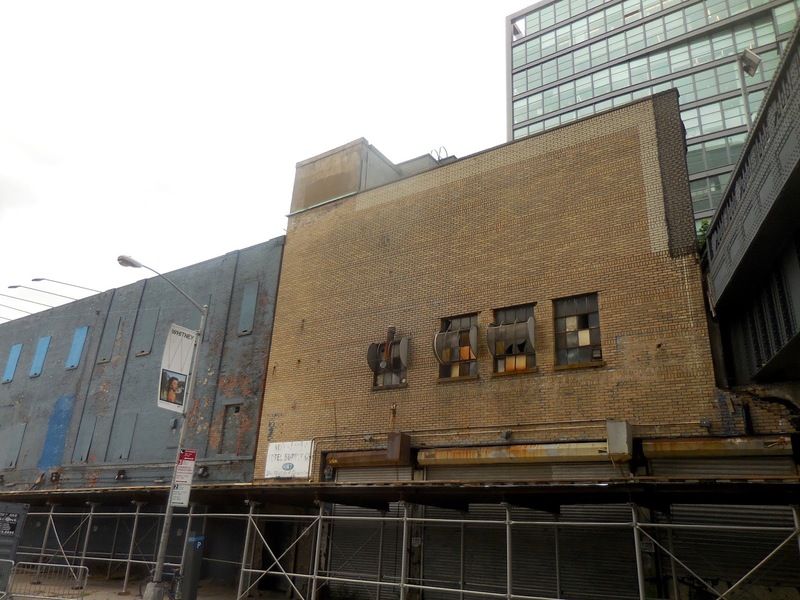 Was it the last of the scrappy meatpacking buildings? The only one not to be demolished or gutted and glossed? It had sat empty for years, blue and gloomy, waiting for slaughter. Nothing this close to the High Line is allowed to live. I liked walking around it, behind it, where people rarely walked. The tourists and shoppers, so cautious, stayed away from it. It must have frightened them in its ragged old bricks. Now that it's gone, the tourists and shoppers are suddenly there. What's coming to take its place? As the big machines dig their hole, a sign on the horizon urges, "GLOSSIER." Of course. The new building must be glossy. Made of glass and twist. Even though so many glass towers are bad for city life. 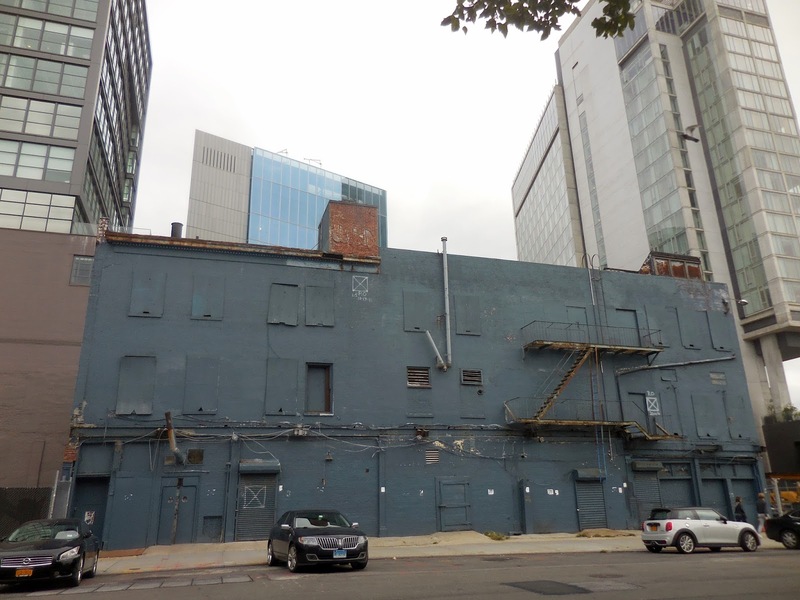 The shiny box coming to 40-56 Tenth Avenue has been named "Solar Carve Tower." Because, in the deadly age of global warming, the sun worshippers will not be deterred. “In addition to producing a faceted, gem-like facade," reads the press release, "this integrated response allows the building to benefit the important public green space of the High Line—privileging light, fresh air, and river views to the public park—while also becoming a new iconic silhouette on the New York skyline." Here's the rendering on the plywood wall. I like to play a game with architectural renderings called Count the White People. 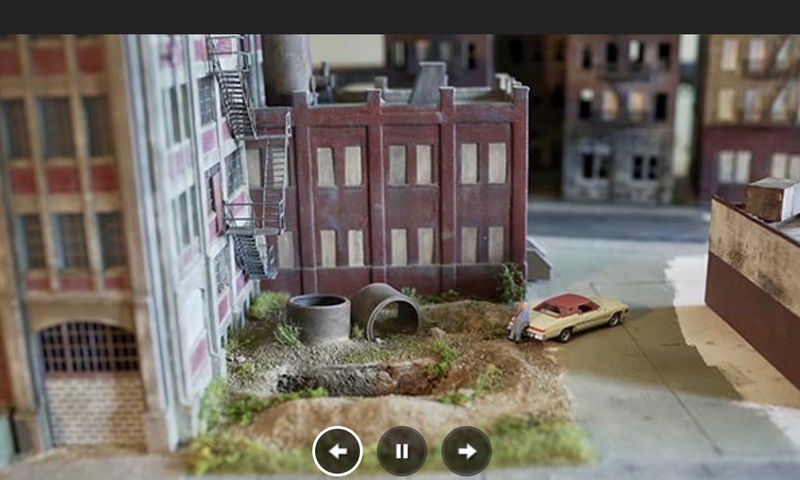 I counted approximately 70 cut-out people total -- on the street, on the High Line, and inside the building itself. They are shiny-happy, strolling, working, talking on cell phones. And 68 of them are (apparently) white. Then there's this guy. He's the only one who might obviously be a person of color. He's also the only one I found who is used twice--his clone stands across the street, back turned. Now I'm worried about the Liberty Inn. It stands across the street, behind the construction site, where it was always protected from MePa's reach. 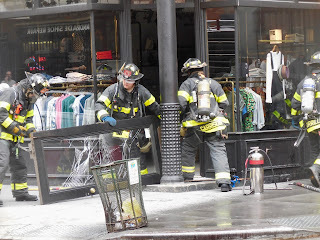 Like I said, the tourists and the shoppers never went back there. Now they will. Now the little Liberty will be exposed. We've seen that happen many times before. Back in the day, the building housed The Anvil. Today, the Liberty Inn is a "romance" hotel. They offer short stays. By the hour. You know what that means. If you want to experience it, I suggest you go sooner than later. How long will the glossy people let it remain? 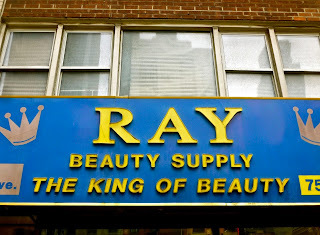 Ray Beauty Supply had been on 8th Avenue off Times Square for over 50 years. 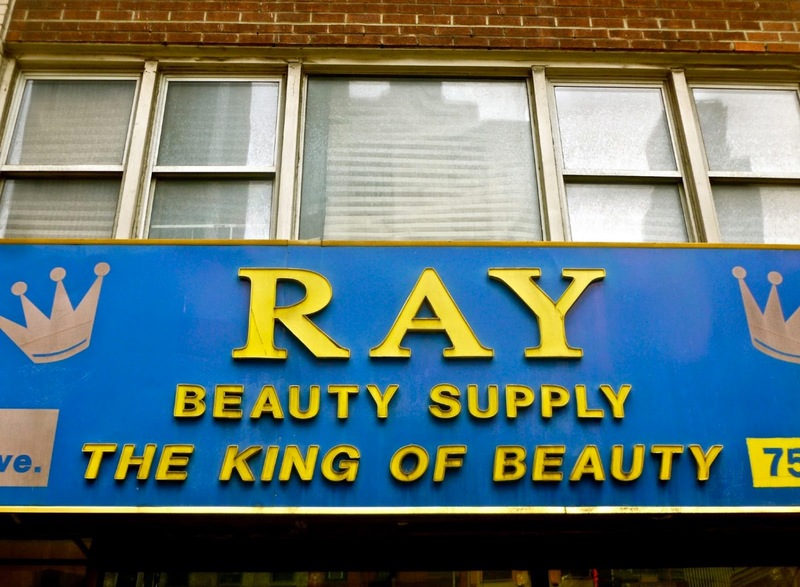 They claimed to be the oldest beauty supply shop in the city. They had personality. And a great sign. 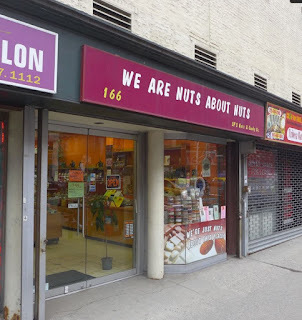 They vanished in 2013 and the storefront sat empty for awhile. Recently, I noticed it's been turned into this chain that sells "artisanal" gelato. They have dozens of "boutiques" all over the world. "The Arcades Project: Contemporary Art and Walter Benjamin" is on view until August 6 at the Jewish Museum. 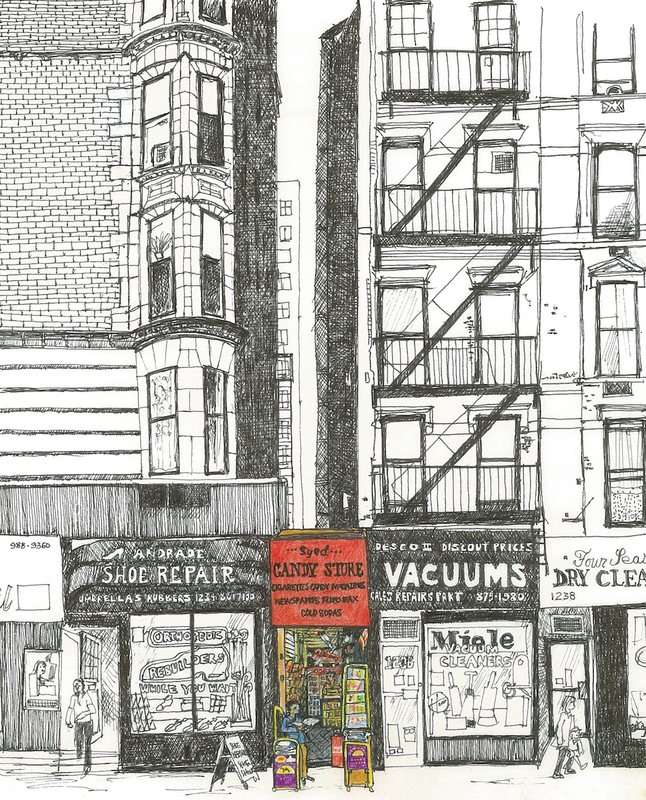 It's about wandering the city, with works by various artists, and poems by Kenneth Goldsmith. Here's a good review to read. 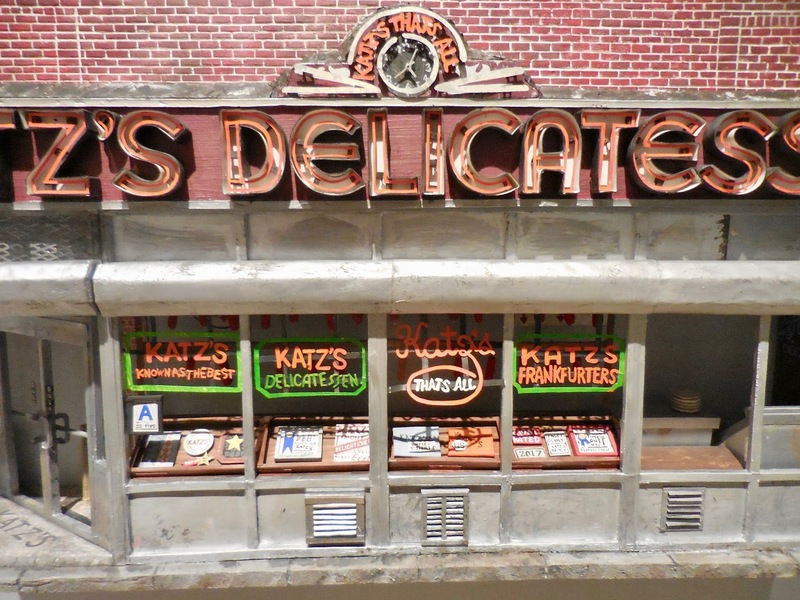 One room features New York City miniatures by Nicholas Buffon. 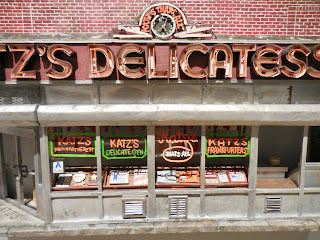 There's Katz's deli, the "new" Odessa (the old one vanished), Stonewall, and the Coffee Shop on E. 14th Street. 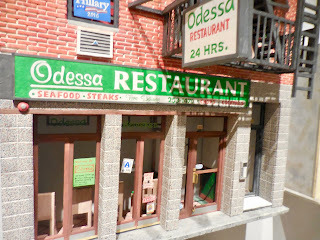 I like miniature New York City dioramas. 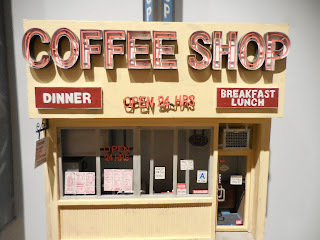 Many times on this blog I've featured the works of Randy Hage, who perfectly captured the dearly departed Mars Bar, and Alan Wolfson, whose gritty little Times Square might make you wish you were Lilliputian. 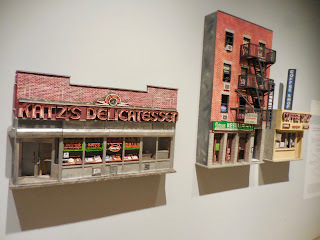 With so much vanishing so fast, eventually all we'll have left of New York will be this mini city. Maybe then someone will assemble all the miniatures in one room and the people of the dead, glass city will stare in wonder and disbelief at what was lost. 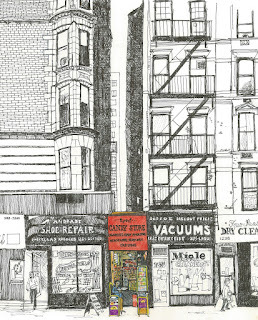 Over twenty years ago, my friend, Gerry Ranson, a British-born illustrator, did a series of pen-and-ink illustrations of dozens of small retail and service shops that he had noticed during long walks throughout Manhattan: shoe repair shops; flower and accessory stores; sandwich and coffee shops; locksmiths and dry cleaners; barbershops, boutiques, and book stalls. What they all had in common is that they were tiny, really small, sometimes no more than a few feet wide and not much higher than a few feet above your head. And for all appearances they looked as if they had wedged themselves into the narrow, forgotten spaces left between two skyscrapers. 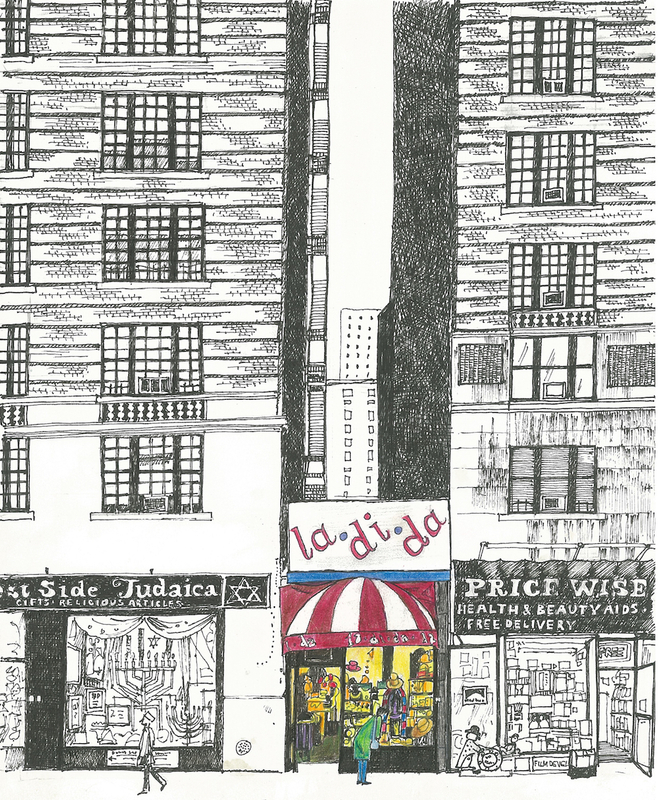 Gerry fell in love with these quirky little shops and deeply admired their plucky owners. 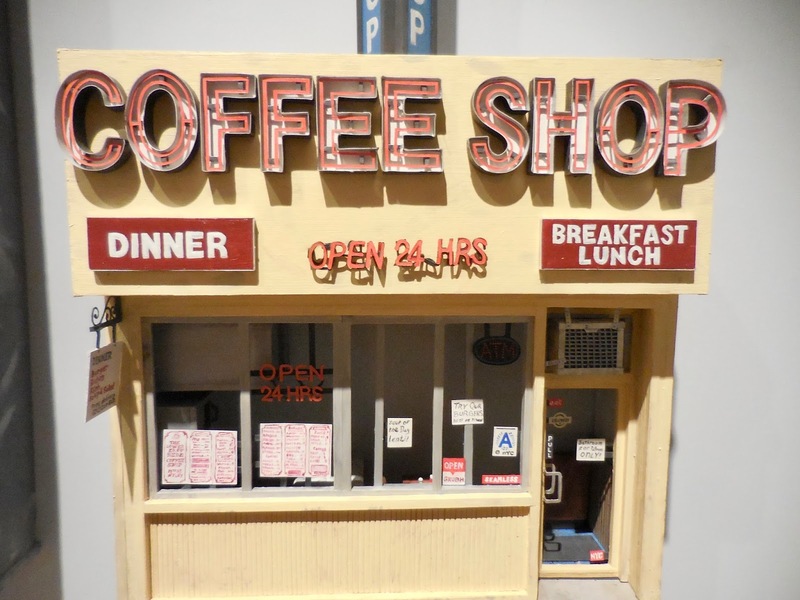 He called the project, “Squeezing Out a Living in New York City,” based not only on their appearance but also on his conversations with the shop owners. Like Gerry, they had come from elsewhere, ready to roll up their sleeves and do what they needed to do, in order to make it in their new home. Gerry did his last sketch sometime in the late 1990s. A lot has changed in New York City since then. 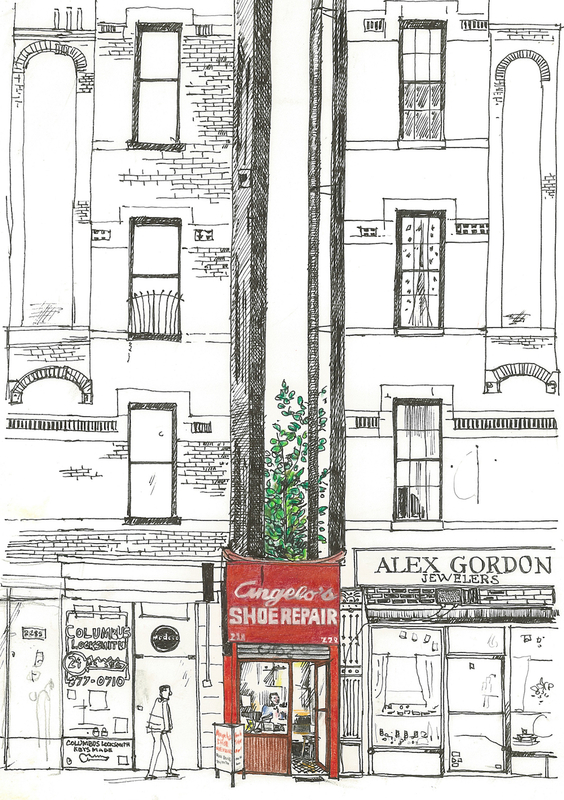 Most of the shops Gerry sketched have closed and most of their owners seemed to have disappeared into the city’s landscapes of memory. 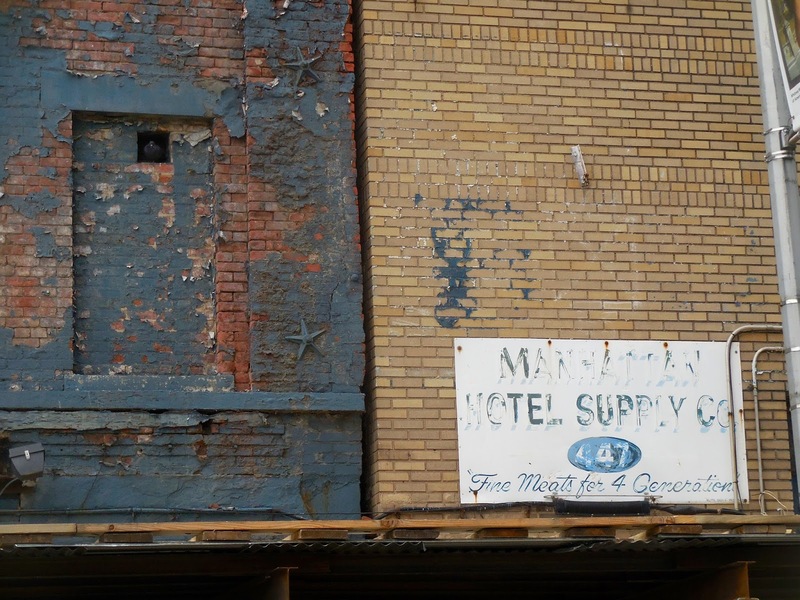 I’m on a mission to excavate them, to find these former shops, and their owners, and recover a bit of the city’s lost history before it’s too late, before they are buried beneath the rubble of construction. For the past two years, I have been walking around the city with Gerry’s pictures, gathering clues by looking closely and by talking to people who work or live nearby. Finding the shops took some time, but was not too difficult. But locating the owners or any information about them has proved more challenging. With so many newcomers and such rapid change to the cityscape over the past twenty years, very few of those who now live or work near the former flower stalls or novelty shops remember them, much less those who used to run them. 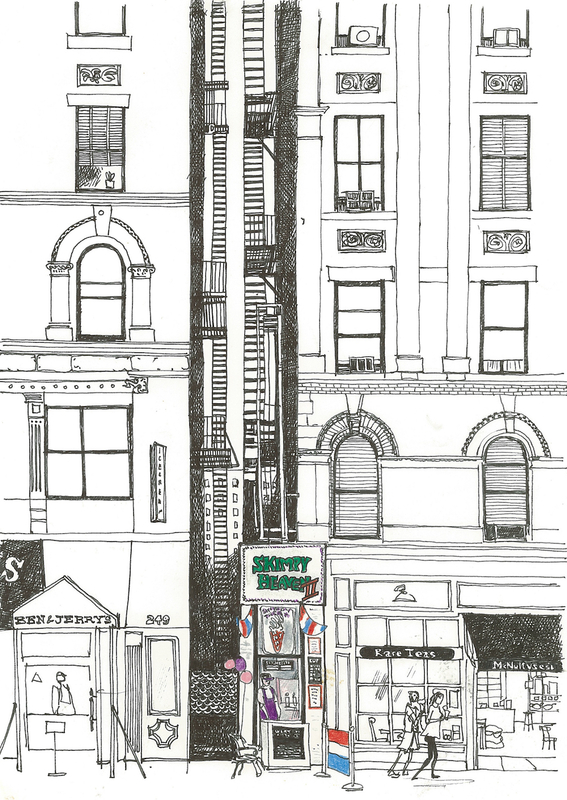 Gerry’s sketches capture a particular moment in New York City’s recent past. The 1990s were in some ways a boom time in Manhattan for newcomers and ambitious, local entrepreneurs. But today’s New York is not the same city that Gerry observed. Not only has crime dropped dramatically, the murder rate by 85 percent since 1990, but the city’s population has grown, from roughly 7.3 to over 8.5 million; subway ridership has doubled to its current rate of nearly 1.8 billion riders; and last year the city attracted a record 60.3 million visitors. While those changes might sound positive on the surface, they only tell part of the story. Over the course of the 1990s rent in Manhattan has increased by 84 percent, and during the early 2000s by 116 percent. Rates of homelessness have now reached levels not seen in New York City since the Great Depression. And despite increases in the Asian and Latino population in certain parts of the city, overall in Manhattan the percentage of white residents has grown while those of blacks and Latinos has declined. 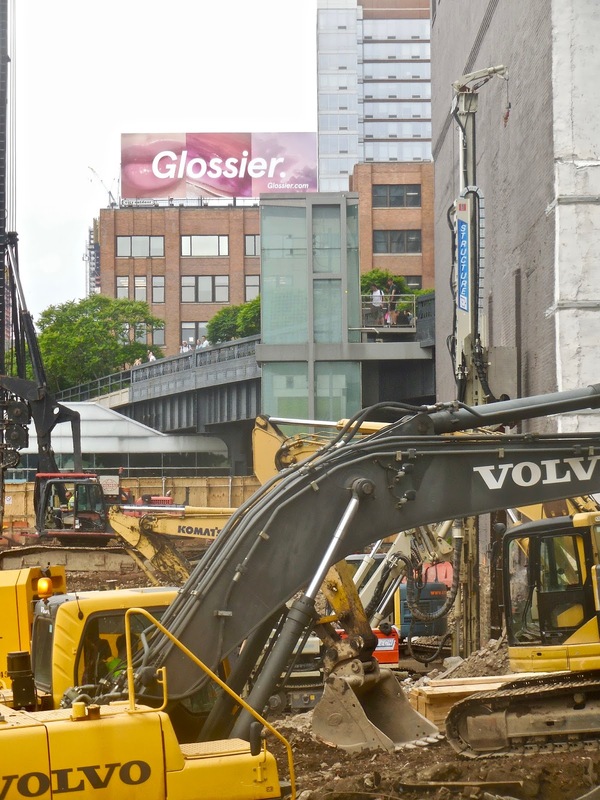 Along with increased rent, and a whiter Manhattan, has come a commercial and residential landscape increasingly dominated by mega-corporations, chain stores, and luxury sky rises. 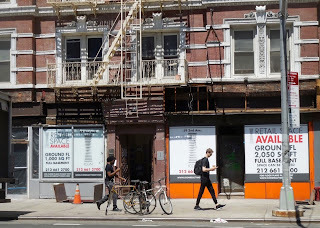 On the street level this has meant more glass-box architecture, more national and international chain stores, and streets populated by empty shops, as landlords hold out in hopes of landing a Dunkin’ Donuts or Starbucks. When he did them, Gerry saw his pictures as a way to capture the spirit of the city as he had experienced it, as a tough place to land but one that ultimately rewarded those who worked hard. It’s a particular vision of New York, and of America for that matter, that is increasingly difficult to maintain in the face of untrammeled globalization and city policies that favor corporations and those passing through town over small businesses and committed residents. My hope is that maybe instead of nurturing nostalgia for what’s lost that we can instead take inspiration from the stories of these unique spaces and the lives that have passed through them. Maybe they will help us cast off the shrug of indifference and reinvigorate our vision of New York City as a place not only for the wealthy and well-connected but as a place for newcomers and old-timers, wealthy and poor, immigrants and native born, as a place that makes room for everyone with a dream and the willingness to dare. That’s the New York City, the America, that Gerry saw and the one to which we should again aspire. 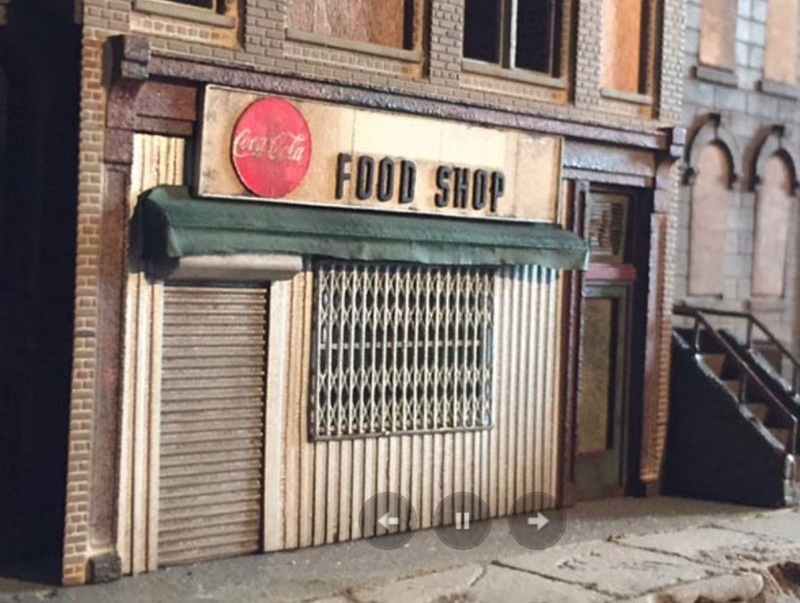 I am hoping that you can aid me in my search and perhaps contribute to “The Gerry Project” yourselves by sharing with me any tips you might have or your memories of the spaces or shops. The easiest way is to do this is to go to the website: The Gerry Project. The site includes pictures of the missing shops, field notes about the search, and photos and observations about what is there today. Can you perhaps help me find the missing shops and their owners? 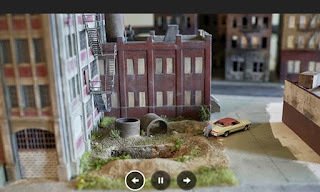 Can you help me gather their stories and save a vital piece of New York City before they are lost forever? 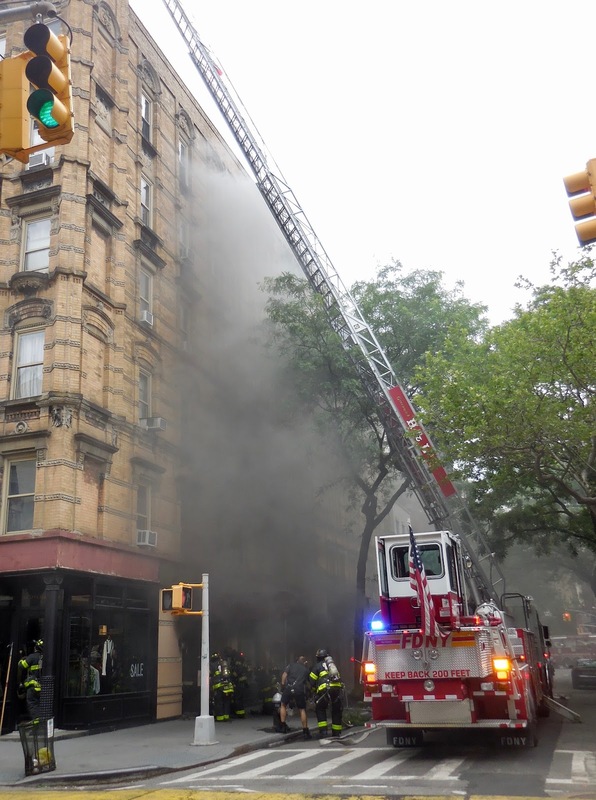 There was a multi-alarm fire this morning at Grove and Bleecker, with large clouds of black smoke billowing out from what spectators assumed to be the basement-level 49 Grove nightclub. No one in the building appeared to be hurt. "This subterranean lair reeks of exclusivity—from the seasonal stretch limo for winter smokers to the chilly PRIVÉ sign posted on the VIP door year round. Inside, uptown Ivy Leaguers and their less intellectual but equally moneyed cohorts people-watch from the plush velvet couches lining the stone walls." 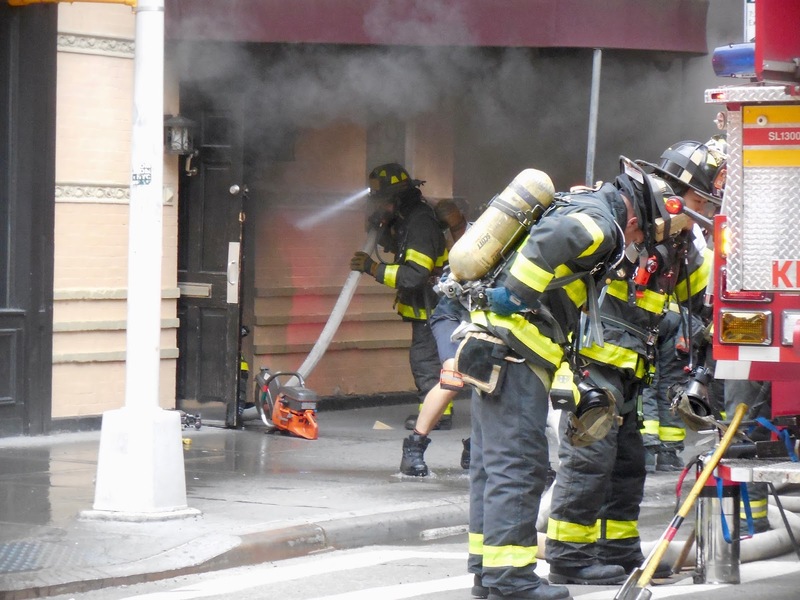 The FDNY responded rapidly. They broke open the door, taking a circular saw to it. When the door opened, the street filled with smoke. 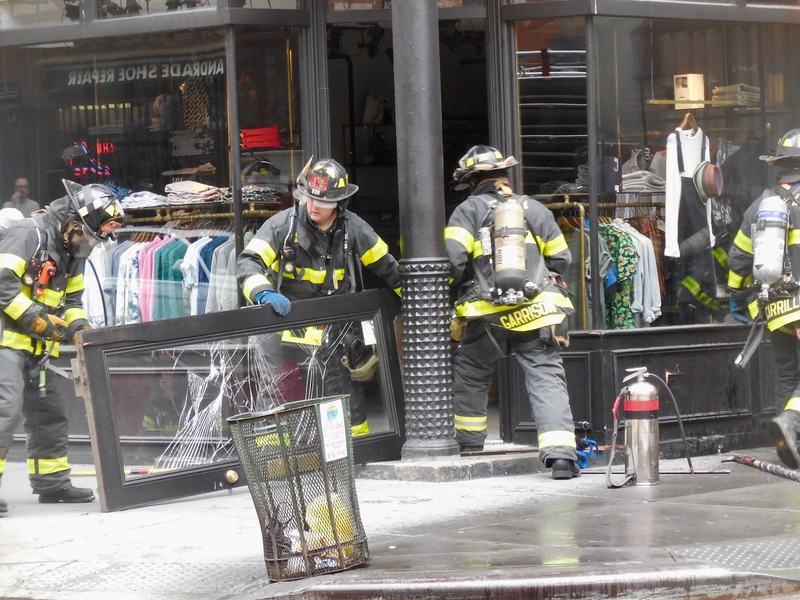 The firefighters smashed and ripped out the front door of the Scotch & Soda clothing chain store on the corner. This is the location of the shop that took over Rebel Rebel Records' space when they were pushed out. One Villager in the crowd noted, "I guess they're gonna have to have a fire sale." 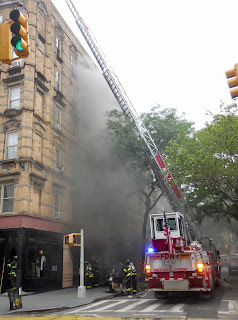 Within minutes, the smoke had diminished. 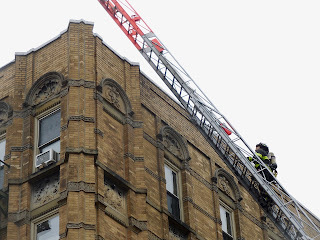 The fire appeared to be under control. 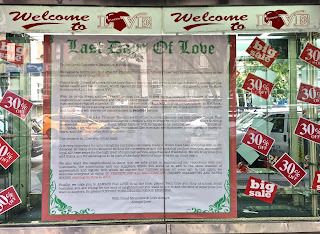 The last Love store in New York City is closing. 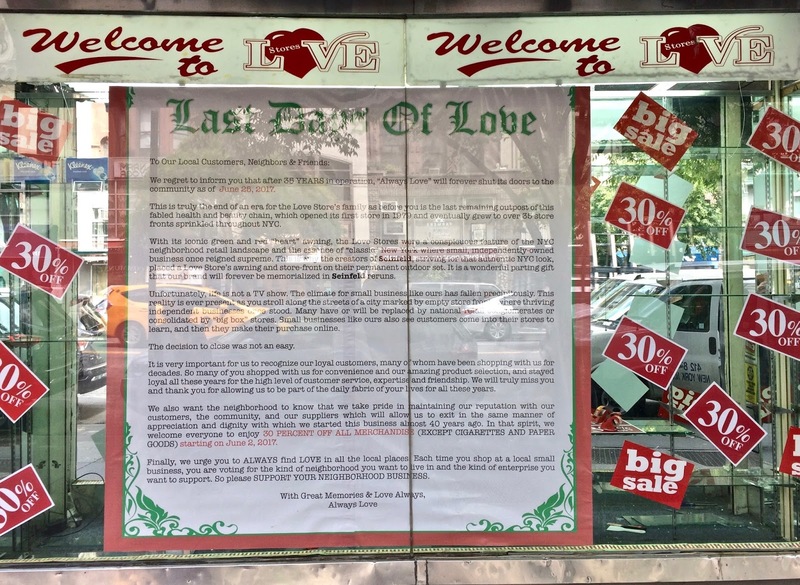 After 35 years, the Love store (discount health and beauty aids) on West 72nd Street will be closing on June 25. As Love says goodbye, they urge you to shop at your local small businesses. While you still can. 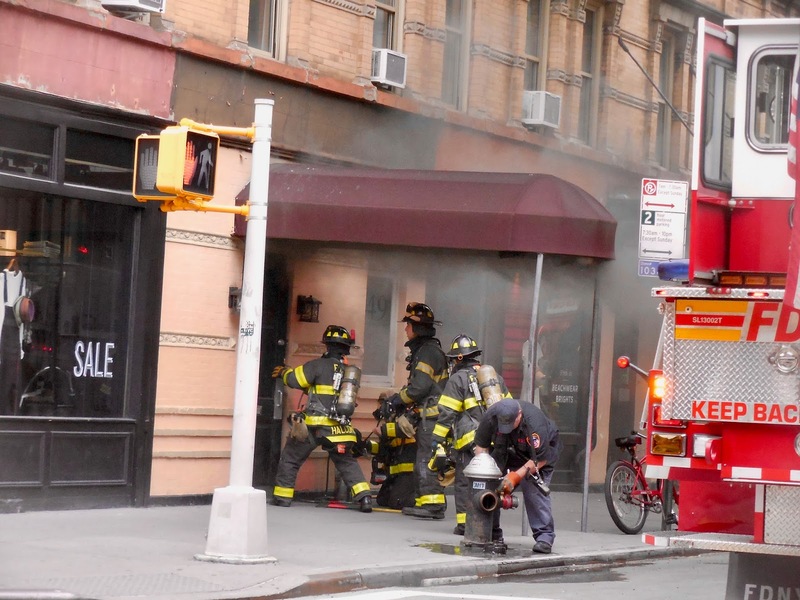 For years, we've been watching the jet-fueled luxurification of western Bleecker Street, a blitz that started with the biting of a pink-frosted cupcake, pushed out dozens of small businesses--from Nusraty Afghan Imports to the great Manatus diner--and has now collapsed into high-rent blight. Last week, State Senator Brad Hoylman published a report on Bleecker's blight and offered solutions, including getting rid of tax deductions for landlords who maintain persistent vacancies--often in the hopes of attracting a national or international chain. 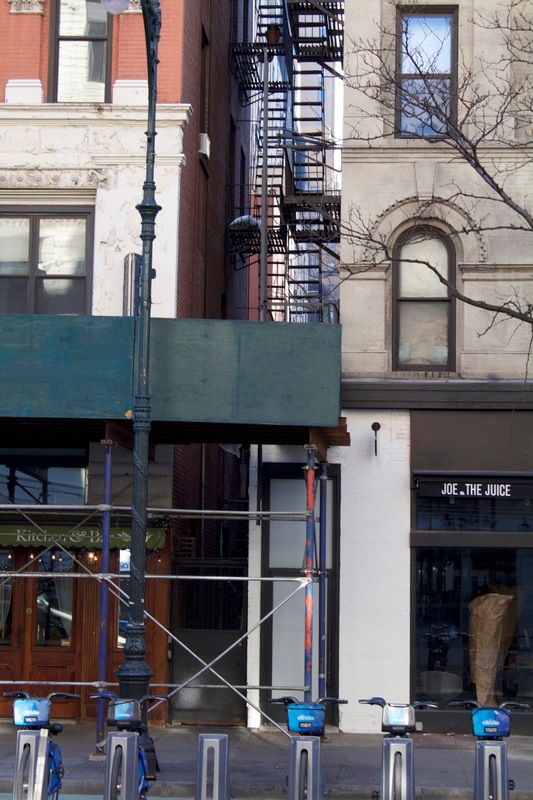 Now, in today's Times, Steven Kurutz thoroughly tells the tale of "How Bleecker went from quintessential Greenwich Village street, with shops like Condomania and Rebel Rebel Records, to a destination for Black Card-wielding 1-percenters, to its current iteration as a luxury blightscape." 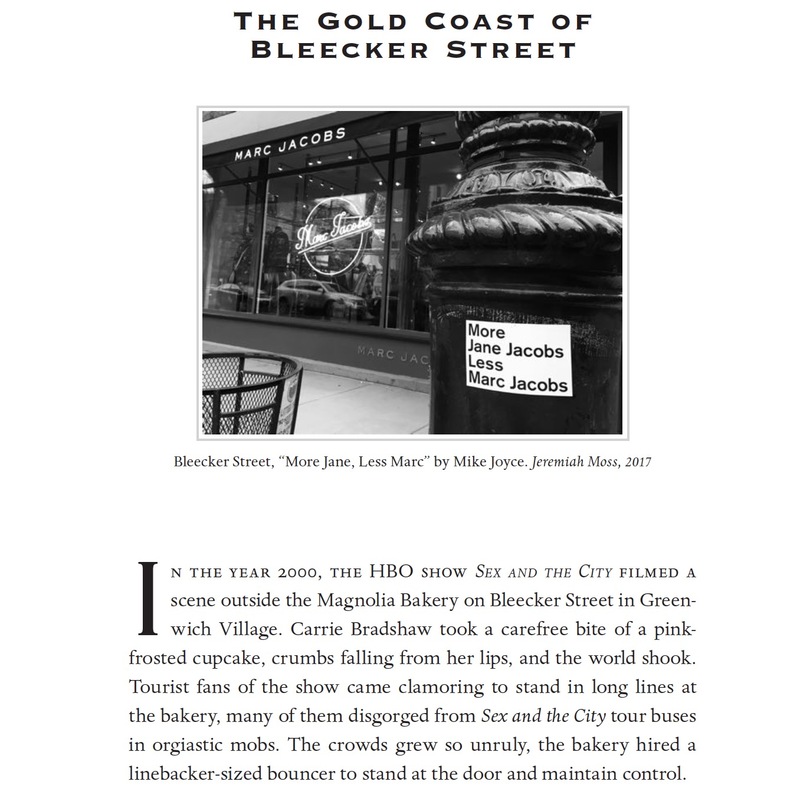 The story starts with that cupcake, spikes on Marc Jacobs, and descends into luxury waste. Kurutz notes: "While quirky independent stores couldn’t afford the new Bleecker, it became apparent over time that neither could the corporate brands that had remade the street. 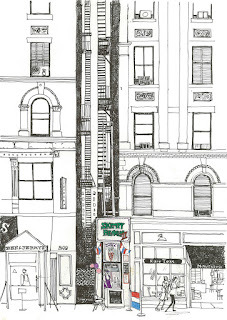 An open secret among retailers had it that Bleecker Street was a fancy Potemkin village, empty of customers." 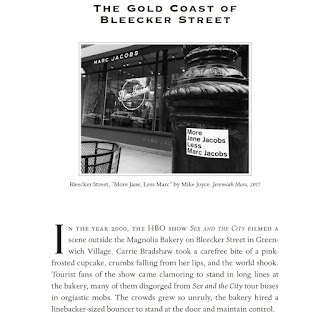 For more on Bleecker's transformation, pre-order my book, Vanishing New York. There's a whole chapter on it.